Author, Broadway Musical "Avenue Q"
When news came last June that Jeff Whitty had won a Tony award for his libretto of the Broadway musical Avenue Q, an honors college staff member went to the Robert D. Clark Library to retrieve the bound copy of Whitty’s honors thesis. It was gone. "It’ll probably show up on eBay," Jeff said on a recent visit to the university. The thesis was a play Whitty wrote the summer after his sophomore year and later staged in the Pocket Playhouse. "It was the beginning of a sensibility that eventually, a decade later, led me to Avenue Q," Whitty said. According to the Avenue Q website, the play follows the story of Princeton, a bright-eyed college grad who comes to New York City with big dreams and a tiny bank account. He soon discovers the only neighborhood in his price range is Avenue Q; still, the neighbors seem nice. Together, Princeton and his newfound friends struggle to find jobs, dates, and their ever-elusive purpose in life. Whitty may have taken inspiration for the story from his own journey. Soon after earning his bachelor’s degree in English, Whitty boarded the Green Tortoise Bus outside the Knight Library and headed for New York City. "Over the ten days I traveled on the Green Tortoise, every inch the bus went east was the farthest east I’d ever been in my life," Whitty said. "I moved to New York blind. I wanted to be in theater. I didn’t know how. But I knew that my future" was in New York. 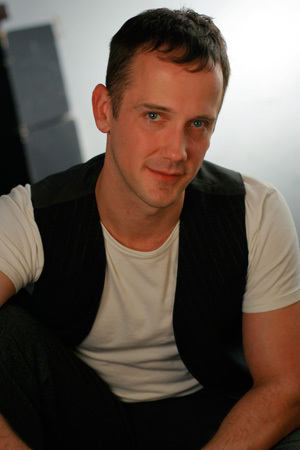 Whitty earned a master’s degree from New York University’s Tisch School of the Arts, continued to write plays, and found work as an actor off Broadway, regionally, and in film and television. That work eventually led him to an April 2001 interview with a creative team of songwriters and producers, looking for a writer. "At that point, Avenue Q had little story, a wild grab bag of characters, and several terrific songs," Whitty said. After Whitty and the two songwriters produced an "unwieldy" first draft, a director came on board, enabling a new level of collaboration. The first draft was thrown out, a new draft was written, then Whitty combined the two. The group held readings as the work developed, finally staging an off-Broadway production in March 2003. The response from the critics and the public "exceeded everyone’s dreams," Whitty said. Avenue Q went on to Broadway, and on June 6, 2004 it exceeded everyone’s expectations by winning Best Book, Best Musical, and Best Score honors at the Tony Awards ceremony. "One of the most amazing things about Avenue Q’s success is that all kinds of people respond to it," Whitty said. "It’s easy to make people laugh, but my favorite response is when people say that they cried - it stars puppets after all." "Good theater overcomes our defenses and puts us in a childlike place where, despite the artificiality of a stage and costumes and script, a bit of life is represented that people allow themselves to enter...It’s magical. A group of people say, 'Watch me!' and another group says, 'Yes, yes, we’ll watch.'"